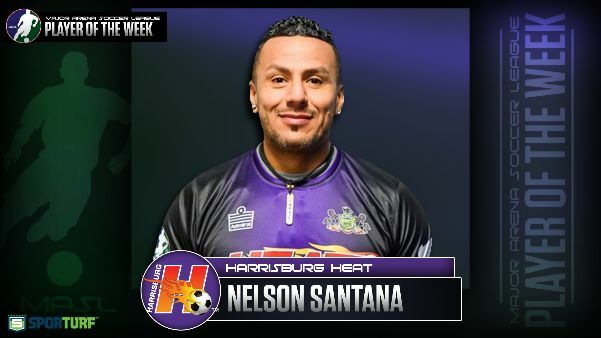 KANSAS CITY (Feb. 1, 2019) – The MASL announced that the SporTurf Player of the Week for Week Nine is Harrisburg Heat defender, Nelson Santana. This is the first Player of the Week award for Santana and the Heat this season. Santana was also featured on the Team of the Week back in Week Two. The Heat is on a roll, winning two games last weekend over Utica City FC and the Baltimore Blast. Santana contributed one assist and two blocks on Friday night against Utica. He followed up with an amazing performance on Saturday by earning a hat trick and adding two more blocks to end the weekend. The Heat get to rest this week, but Harrisburg will look to continue their winning streak when they head to Baltimore next week. The game is scheduled to kick off at 3:05 p.m. ET from The SECU Arena in Towson, MD. The match will be broadcast live on MASLtv at MASLSoccer.com.